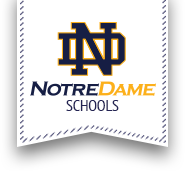 School uniform ordering and purchasing will take place on Monday, July 24th, 4:00 - 7:00 p.m. in the Notre Dame Jr/Sr High School gymnasium. The Flynn and O'Hara School Uniform Company will be measuring all students enrolled at Notre Dame Elementary School as well as the Jr/Sr High School. This is a perfect opportunity to deal directly with our uniform company in person, and avoid the challenges (wrong item, different style, too big, too small, etc.) of on-line clothing shopping. They are generally well-stocked for all of your uniform needs.